The park is open 8am-sunset. Directions for this park are currently unavailable. Please call the park. Los Angeles State Historic Park provides an extraordinary opportunity for recreation and education in the heart of Los Angeles. Within its 32 acres of open space directly adjacent to Chinatown, park visitors can wander pathways and enjoy a view of downtown, as well as discover and celebrate the natural and cultural heritage of Los Angeles. In 2006, California State Parks developed a temporary, 13-acre portion of the park so that the public could enjoy the park immediately. Since that time we have developed partnerships with educational institutions and community organizations to allow for creative and innovative public events. State Parks invites you to continue to engage in the past, present and future of Los Angeles at Los Angeles State Historic Park. You can run, walk, ride a bike, have a picnic, fly a kite and even look for urban wildlife such as birds traveling down the Pacific flyway. Do all of these things and more while inventive architectural features in the landscape hint of the park’s history. The Metro Gold Line zips past the south side of the park on raised tracks following the course of a water system that stretched from the Los Angeles River to El Pueblo in the early 1800s. It may be difficult to imagine, but this place was once a fertile basin, and within a mile of the park is the last recorded location of Yang-na, a large Tongva village. The history of the Southern Pacific Railroad’s River Station, opened in 1875, includes a waterwheel, freight house, roundhouse, depot and station yard. Rows of deer grass now hint of the vanished railroad tracks, and you can stand and reflect on the travels of the thousands of people who arrived here from all over the country and world. The Pacific Hotel opened here in 1879 and once served “25 minute meals” to River Station passengers. The approximate shape of the hotel is marked today by a boundary of recycled glass. Several historical buildings are within walking distance of the park. On the north side, the Flat Iron Building is the second oldest industrial building standing in Los Angeles and dates from 1890. On the southern end of the park, the Capitol Milling Company building from 1883 is easily visible. Surrounding the Park are the historic and ethnically diverse communities of Lincoln Heights, Elysian Park, Solano Canyon, Chinatown, Chavez Ravine and William Mead Homes. For special events or to perform commercial or student filming or photography at the park, you need to contact the Special Event and Film Permit Coordinator, Larry Fulmer at larry.fulmer@parks.ca.gov for information on requirements and fees. The park is located just a mile away from the Los Angeles Union Station, making it accessible from several routes. The Interpretive Media Laboratory (IMLab) is a new joint program of the UCLA Center for Research in Engineering, Media and Performance (REMAP) and the State of California Department of Parks and Recreation. Its focus is to research, develop and maintain innovative interpretive approaches for the new Los Angeles State Historic Park. For a more detailed description and how to participate, we encourage you to follow us at the following link - please click here. All pathways and restrooms are accessible. 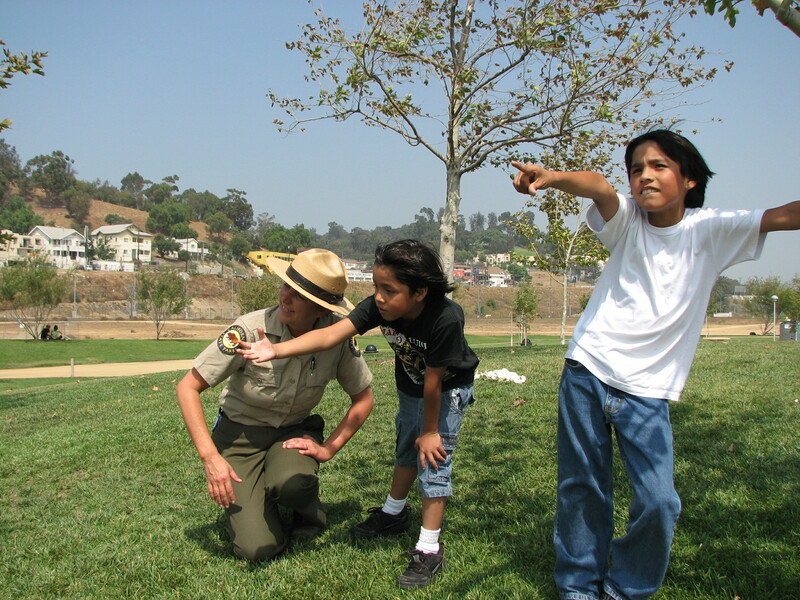 Free guided interpretive programs and public events are offered at Los Angeles State Historic Park. For information visit our events calendar, or call park staff at (323) 441-8819 or (323)441-8401. Become part of our Volunteers in Parks program to help protect and preserve your heritage! We are seeking volunteers to assist with interpretive programs, special events and other special projects. We invite you to share your special talents, passion and enthusiasm. Being a volunteer, you work with State Parks Rangers and Park Staff, participate in outstanding learning opportunities, and volunteer experience helps you when applying for all types of employment. Contact the Park Interpreter at (323) 441-8819.